ALBIA LEADING scorer Blake Chance challenges 6’6” Nathan Weaver for a first half basket. JUNIOR FORWARD Joe Teno goes up over the top of Chariton defenders to score. 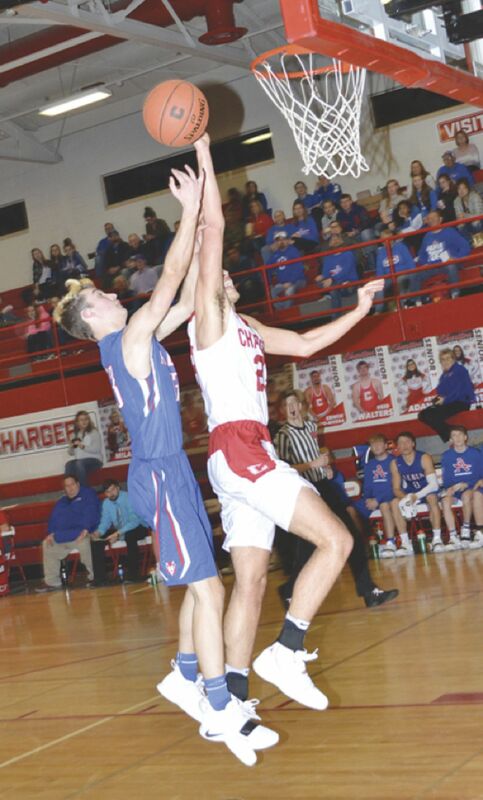 The fans at the Charger Dome in Chariton were treated to an awesome battle on the basketball floor Friday night that featured six tied scores and 21 lead changes, with Chariton prevailing over the Albia Blue Demons 51-47. The first quarter set the stage as defenses on both sides limited scoring opportunities. Nate Crall hit a three point goal to start the scoring on the night for Albia and after a field goal by the Chargers’ Nathan Weaver, Crall hit a second shot from outside the arc at the 3:33 mark. Albia’s Joe Teno picked up his third foul and was relegated to the bench for the remainder of the half. Weaver scored again and later hit two free throws at the 2:50 mark to tie the game at 6-6. Blake Chance and Blake Stewart put Albia in the lead with two each from the charity line only to have Weaver hit a three point goal in the final seconds to make it 10-9 going into the second quarter. Albia changed up defenses to start the period and a driving jump shot by Chance gave Albia a 12-9 margin. Weaver scored on the next two possessions to cut the deficit to 12-11. Nate Wynn hit a free throw to give Albia some breathing room but an offensive rebound and putback by Weaver tied the game at 13-13. On the next possession Weaver scored again to give Chariton its first lead of the game and yes, Weaver scored all 15 points on the Charger side of the scoreboard. Brayden Messamaker hit a three-point goal and Chance hit a step back jumper to put Albia back in the lead 18-15 but at the 1:45 mark Chariton’s Dylan Cain scored inside and with 45 seconds left in the half Weaver scored again to give the Chargers a 19-18 lead. Wynn grabbed an offensive rebound for Albia but with five seconds on the clock Chariton scored to give them a 21-20 advantage at the half. The third quarter was a seesaw battle. 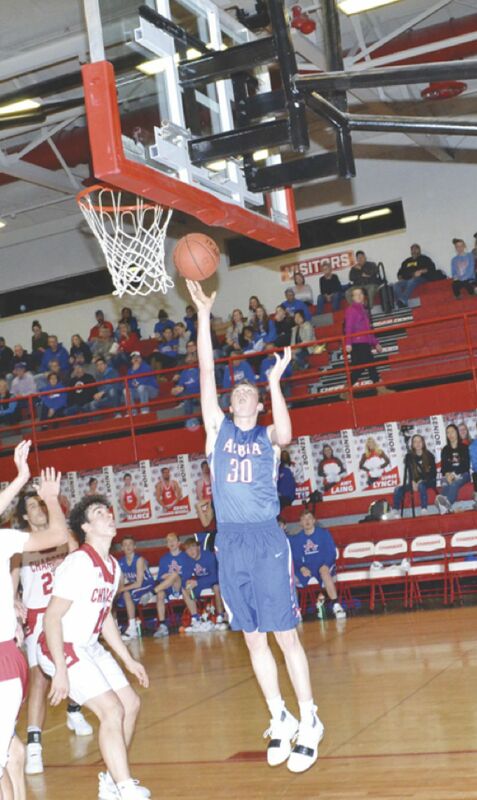 Wynn put Albia ahead with a putback but Weaver continued his determined scoring. At the two minute mark a field goal by Chariton gave them the largest margin in the game to that point 33-29, but a deep three point goal by Messamaker and a fall away jumper by Chance put Albia on top 34-33 and even though in the last possession of the period the Chargers had four shots on goal, all missed and Albia led 34-33 going into the final eight minutes. After the Chargers hit a field goal to retake the lead Chance scored on a drive. Weaver scored his 29th point of the game at the 6:40 mark but Chance answered with a three point goal and later hit Teno with a great pass to go up 41-39. Albia managed only a free throw in the next two minutes while Chariton was able to score twice and hit a free throw giving them a 46-42 lead with 1:08 left in the game. With 59 seconds left Chance scored on a drive. On the next possession Chariton planned to run out the clock and with 45 seconds left Albia fouled to put Brodey Johnson on the line with a one-and-one. He hit both clutch shots to make it 48-44. With 27 seconds left Chance banked in a three point goal to make it 48-47. Albia fouled on the next possession and sent Jackson Curnutte to the line for a one-and-one. He made one to make it 49-47. Albia failed to score on their next possession and had to foul, Curnutte made two more free throws and Albia’s bid to win their fifth SCC game fell short. Weaver scored 29 points and had eight rebounds for Chariton. Albia goes to 9-3 on the season.